Retirement planning is the complex process of developing a comprehensive game-plan to properly fund your retirement. At Success Wealth Management we take into account numerous variables that come into play when planning your specific Retirement goal. We utilize a broad range of investments, tax, and other retirement strategies. Lastly, we implement a variety of modeling techniques in order to assess the possibility of success or failure of various retirement strategies. Retirement planning is appropriate when people have ongoing, current, and future financial goals they wish to achieve. We educate our clients on a number of strategies available to them and then assist in the coordination and implementation of their game-plan to help you attain those goals. First, we need to determine your retirement income needs: a common approach is to start with a percentage of your current income (e.g., 60 % to 100%). An alternative approach is to begin with current expenses and inflate them by a reasonable rate. In recent years, the average annual inflation rate has typically ranged from about one percent to two percent. It is important to consider fluctuations that may occur to expenses in retirement such as paying off a home mortgage and the potential for increased health-related expenses. A realistic projection of retirement expenses also must factor in the anticipated retirement age, life expectancy, and the effects of possibly living beyond one’s life expectancy. 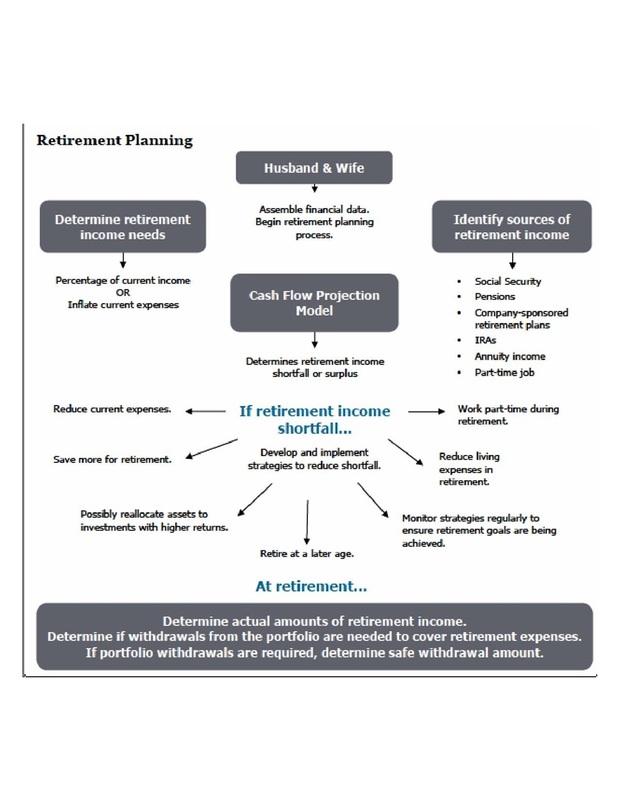 Second step is to identify sources of retirement income by estimating future income and assets: Types of retirement income may include Social Security, a company or government pension, a company-sponsored or business retirement plan such as a 401(k) plan, a simplified employee pension (SEP), a savings incentive match plan for employees of small employers (SIMPLE IRA), 403(b) plans, and 457(b) plans. Additional sources of retirement income may include an individual retirement plan such as an IRA, annuity income, or a part-time job during retirement. Estimating the future value of one’s assets, both taxable and tax-deferred assets, should utilize conservative projected rates of growth on those assets (e.g., 4 percent to 5 percent), both pre-retirement and post-retirement. Then, a cash flow projection can reveal whether or not there is a need to make portfolio withdrawals to cover expenses in retirement. Reduce current expenses, to be able to save more before retirement. Re-allocate assets to investments that have the potential for higher returns (remembering that higher potential returns may result in a greater risk of loss). Retire at a later age. Reduce living expenses during retirement. Maximize contributions to employer-sponsored retirement plans. If maximum contributions are not feasible, consideration should be given to contributing at least the minimum amount needed to receive the employer’s matching contribution. Contribute to individual retirement accounts (IRA) if allowed by the tax law. Pursue other possible options to save for retirement, if appropriate – other investments (e.g., stocks, bonds, mutual funds), non-qualified deferred compensation plans, salary continuation plans, employee stock purchase plans, annuities, and/or life insurance. The fourth step an important step in the retirement planning process. We monitor your progress towards the achievement of your retirement goal on a regular basis as there are personal changes and economic changes that may require a review of our originally designed game-plan. As retirement approaches, the actual amount(s) of retirement income can be more easily determined. For instance, the Social Security benefit can be ascertained, a defined benefit pension plan payment can be obtained from the employer and the benefit calculation can be verified, and actual retirement account values (e.g., 401(k) plans, IRAs, etc.) can be determined. Then, it can be established whether or not withdrawals may need to be taken from portfolio assets (i.e., tax-deferred savings vehicles and/or taxable accounts) to cover retirement expenses. The goal is to determine how much can safely be withdrawn from the portfolio and spent on a recurring basis without an excessive risk of running out of money or having to decrease one's standard of living in retirement. The retirement planning process involves numerous tax ramifications, both pre-retirement and post-retirement. There are employer-sponsored retirement plans that allow for employee contributions which are deducted from salary as pre-tax contributions and consequently are not included in the employee’s current income. In addition, the investment earnings in the plans are tax-deferred until withdrawn. Examples of such plans are 401(k), 403(b), and 457(b) plans. These plans may also include employer-matching contributions that are not currently taxable to the employee. There are various annual limits on the employee and employer contributions. Some companies or government agencies offer defined benefit or pension plans in which the company or agency contribute amounts to the plan to provide future retirement benefits. Generally, from the employee’s standpoint, the employer’s contributions are not currently includible in the employee’s income for tax purposes. The retirement benefits are normally income taxable at the time of distribution to the employee. A client may make tax deductible or nondeductible contributions to a traditional individual retirement account (IRA) and nondeductible contributions to a Roth IRA. However, many limits apply. The limits on deductible IRA contributions and nondeductible Roth IRA contributions are also subject to a phase-out at certain levels of modified adjusted gross income. Qualified distributions from a Roth IRA are generally tax-free. In addition, there are SEP and SIMPLE IRAs that allow for larger contribution amounts. Such contributions are made on a pre-tax basis and are therefore not includible in the employee’s current income. When distributions are made, the entire amount distributed is then generally included in the employee’s/retiree’s income. Premature distributions (e.g., prior to age 59½) from qualified plans and IRAs incur a penalty of 10 percent on the taxable portion (i.e., from deductible contributions) of the premature distribution in addition to the regular income tax due on the distribution. The penalty is not imposed on the portion of the premature distribution that is a nontaxable return of basis (i.e., from nondeductible contributions) or is rolled over to another qualified plan or IRA within certain time limits. There are several detailed exceptions to the penalty for premature distributions. The “required minimum distribution” (RMD) rules require retirement account owners to take distributions that are subject to income taxation. The rules apply to qualified retirement plans, 403(b) plans, 457 plans, and IRAs with the exception of individual Roth IRAs during the account owner’s lifetime. Distributions must begin by the “required beginning date” (RBD) and continue each year in the minimum required amounts. The RBD for qualified plan participants who own greater than 5 percent of the employer business and IRA owners is April 1st of the year following the year in which they reached age 70½, even if they are still working. There is an exception to this rule for qualified plan participants who are still working after age 70½ for the employer sponsoring the plan and own 5 percent or less of the business. These plan participants can delay distributions until they actually retire as long as the qualified plan allows for it. Any portion of an RMD that is not taken on time is subject to a penalty of 50 percent of the unpaid amount of that RMD. The beneficiary designations on retirement plans need to be properly coordinated with the client’s estate plan, to avoid any adverse estate, gift, income, or other tax results. Social Security benefits paid may be taxable income if one has additional earned income and/or had significant investment income during the year. In this case, one may have to pay income tax on a portion of the Social Security benefits received. Currently, up to 85 percent of Social Security benefits may be taxable depending upon one's tax filing status and the total amount of income received during the year. Taxable assets/accounts in one's portfolio do not receive the same preferential income tax treatment that the retirement plans previously mentioned receive. Examples of such taxable portfolio assets include interest-bearing accounts (e.g., money market, CDs, taxable bonds, etc. ), stocks, and mutual funds. In general, the earnings on these taxable accounts (i.e., interest, dividends, capital gains, and other income) are taxed in the year received or generated. In other words, there is no tax deferral on taxable account earnings as there is on retirement plan earnings. However, there may be special tax breaks such as for qualified dividends and capital gains which may qualify for lower tax rates. Your Success Wealth Management Financial Advisor holds the Chartered Retirement Planning Counselor℠ or CRPC® designation.